Nancy Carlisle, curator at Historic New England, examined the chest with a flashlight while Clark Pearce looked on. NEWBURY, MASS. 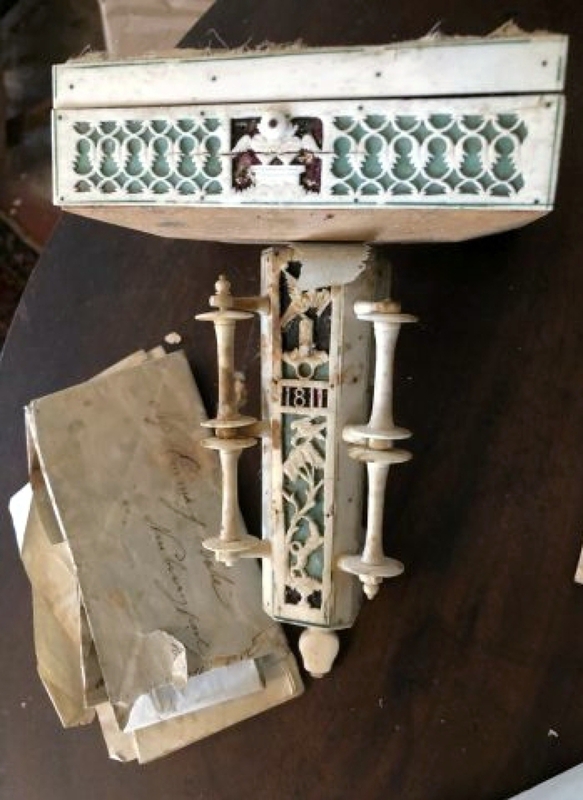 – When a dowry chest missing both its lid and its drawer sells for more than $57,000, you know you are not witnessing an ordinary auction. 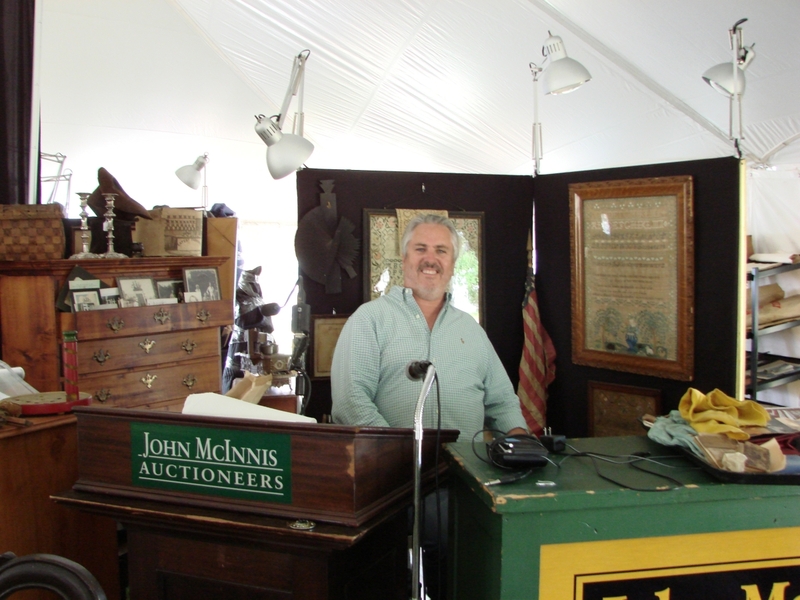 Some called John McInnis’s June 23-24 auction the sale of the year. Others called it the sale of the decade. Whatever it is called, it is an auction that will be remembered. 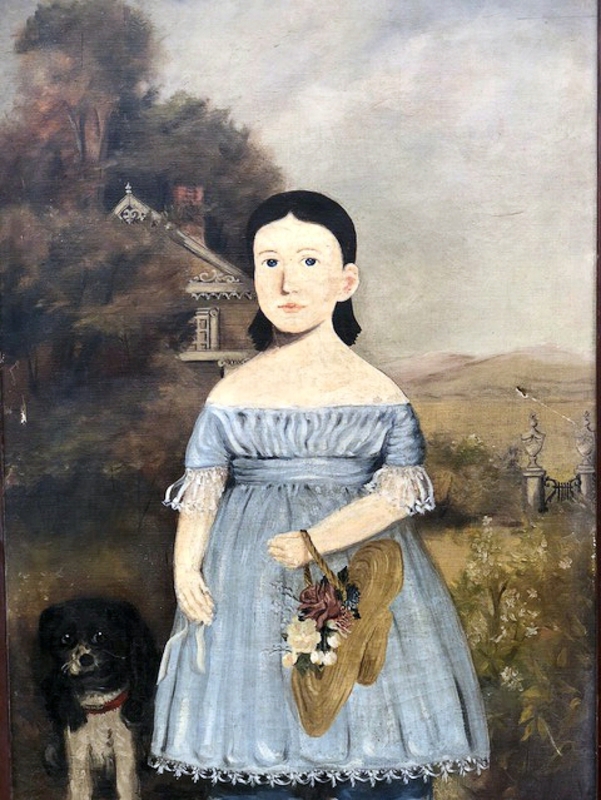 Nearly everything came from the house, barn and outbuildings, which had been home to 11 generations of the Plumer family, one of the original settlers and proprietors of the town of Newbury. The family’s first home had been built in 1638, but along with all the other first period houses in the neighborhood, it had been replaced in the Eighteenth Century. Fittingly, it was just across the street from the town’s lower green, the site of the sale. Nothing in the house had been altered, most of the contents were in exceptionally good original untouched condition, and these factors contributed to the high level of interest. In addition, everything was sold without reserve, and McInnis decided not to use internet bidding. The result? 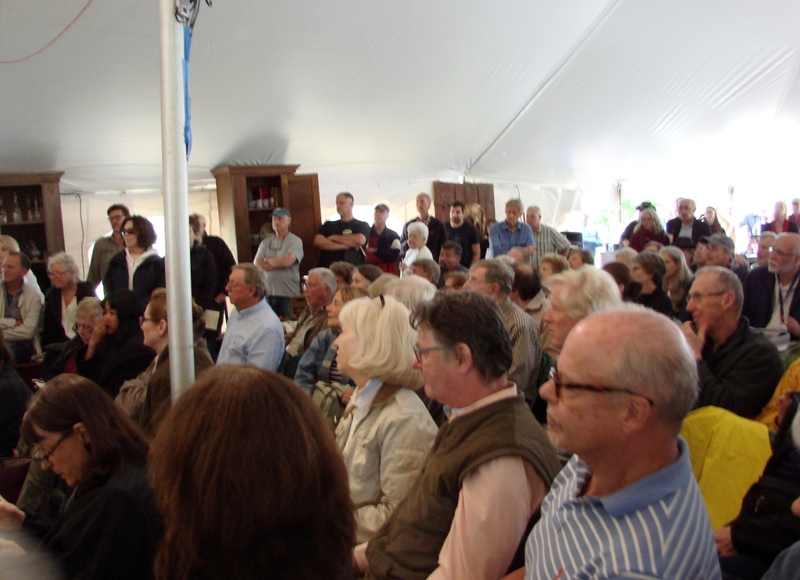 A huge crowd, more than 400 bidder numbers distributed, very strong prices and sales totaling more than $500,000. 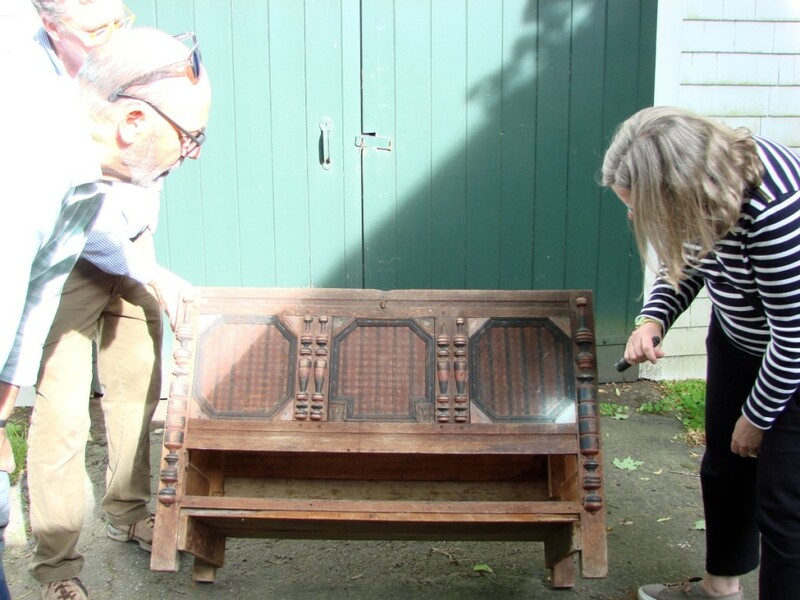 A family trust established years ago instructed that all monies received from the sale were to be donated to charities, some of which were local. 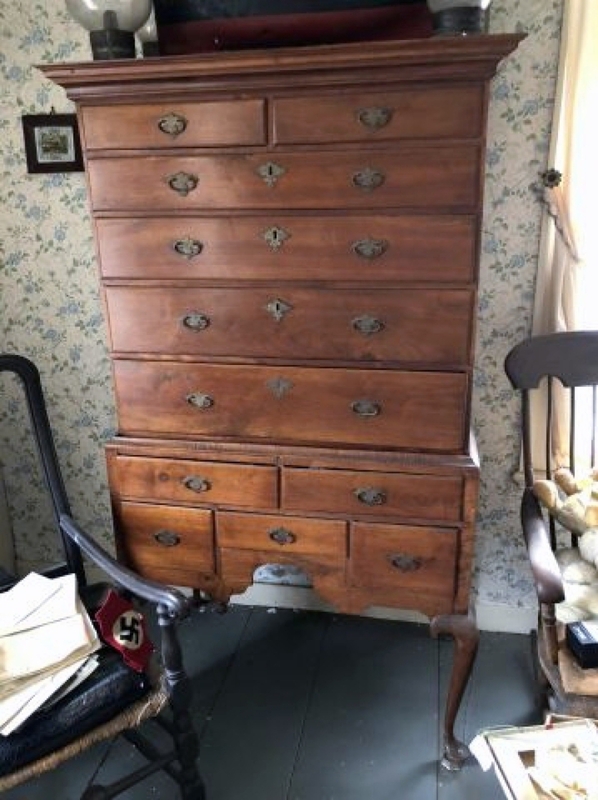 The chest lacked its lid and drawer, but more importantly, retained its original painted surface. Its cross-hatched pattern was clearly discernible, as were the original red and black colors. Lane said, “Winterthur has four or five pieces probably made by the Emory shops, but none with original paint. We’re a teaching institution and this chest would clearly demonstrate what the original surface looked like. The fact that it’s missing the lid and the drawer is unfortunate but it’s still a very important piece. I don’t think there are more than a handful of examples known in this condition. It’s also the only one with such a well-established provenance. There’s no doubt where it came from. 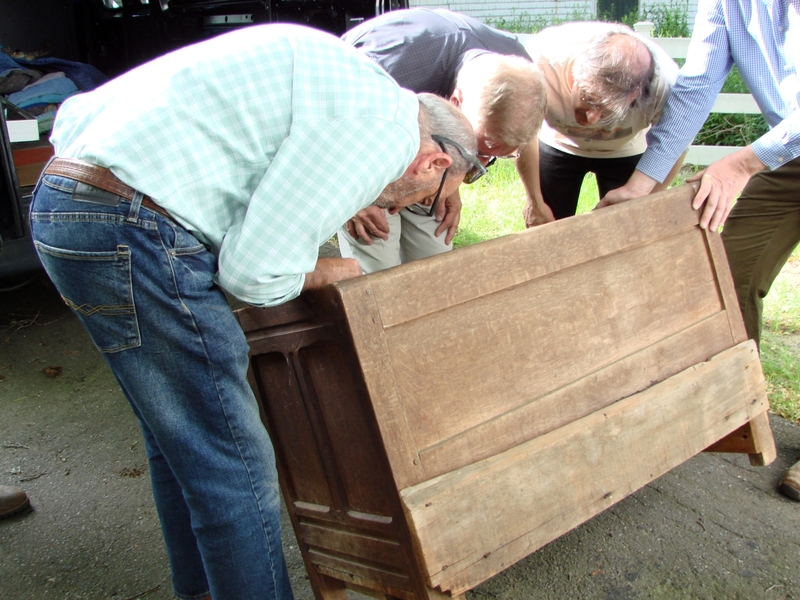 It was obvious that the only thing the family ever did was to nail an old board on the back to make it more serviceable.” When Meader was questioned about the missing lid and drawer, he said “You better believe that I looked all over that house and all the other buildings, but they’re just not there.” The chest sold to a local collector for $57,500. Gallery director Dan Meader had been storing the Marklin tin boat Amerika in his van for safekeeping. It was the highest priced item in the sale, earning $120,750. 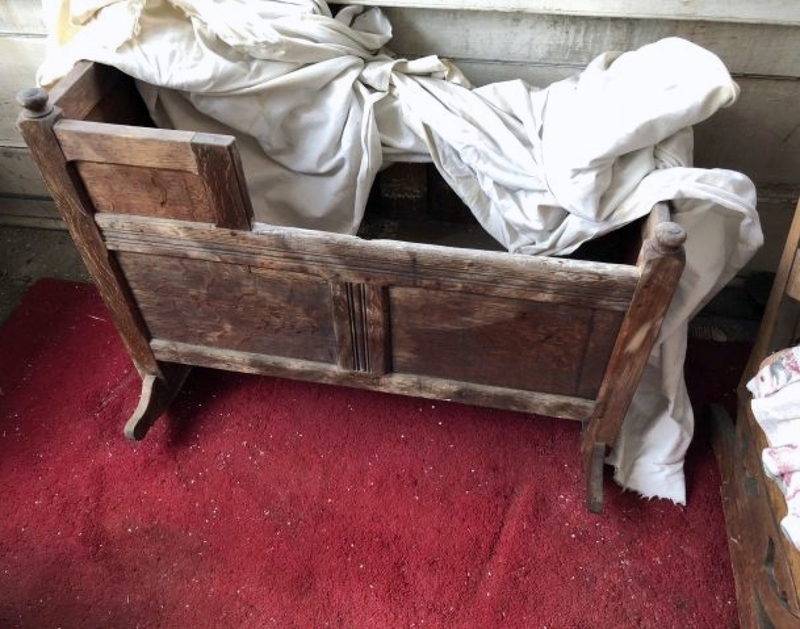 Another very early piece was an oak cradle, possibly made by Serj. Stephen Jaques for his brother-law Ephraim Plumer at the time his first child Mary was born in 1681. The cradle sold for $18,400. Both this cradle and the dowry chest were included in the 1986 exhibition at the Newburyport Historical Society, “Old-town and the Waterside,” and both were pictured in the catalog written by Peter Benes. 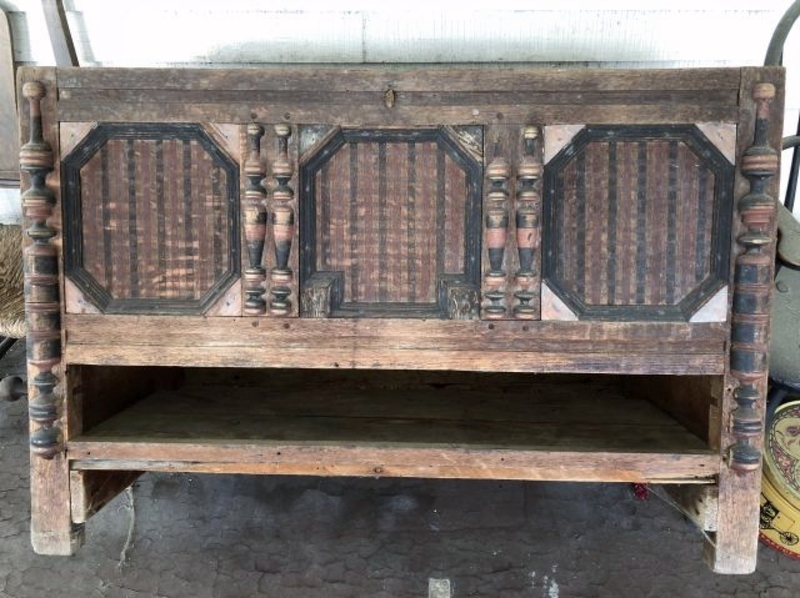 In that catalog, Benes states that the chest is one of nine with identical turnings and panels. 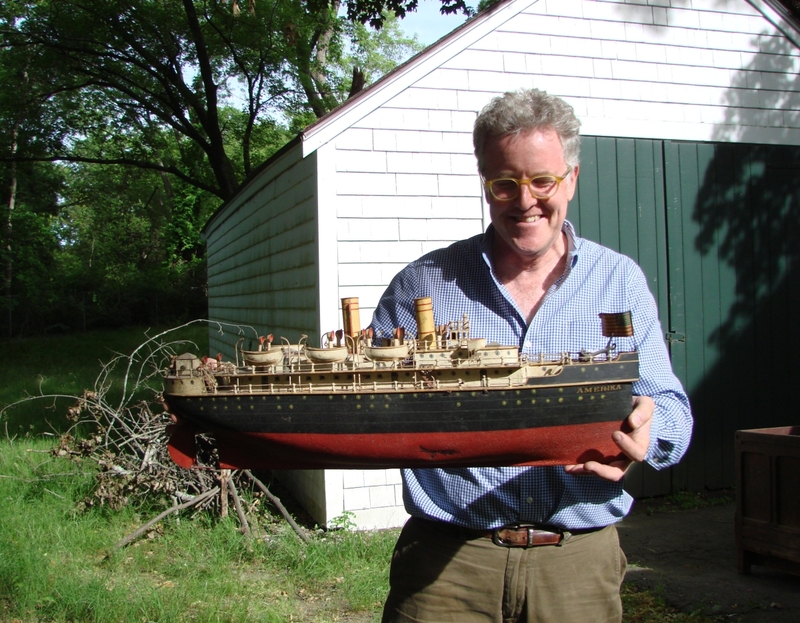 Tom Sage, the Allentown, Penn., toy dealer and collector was present at the auction and bought the 28-inch Marklin toy ocean liner, Amerika. It was the highest priced item in the auction, finishing at $120,750. The boat was made about 1912, and for the last several years, sat atop a walnut highboy in the house that family trust members thought was worth much more than the toy that sat on top of it. (The highboy sold for $3,540.) The boat, as with most everything else in the house, was in fine original condition, with all life boats, flags and accessories intact. Some in the audience said they had heard that Bertoia Auctions had sold an Amerika in 2016 for more than $270,000. It should be noted that the Bertoia example was 38 inches long, substantially larger than the Plumer family example. 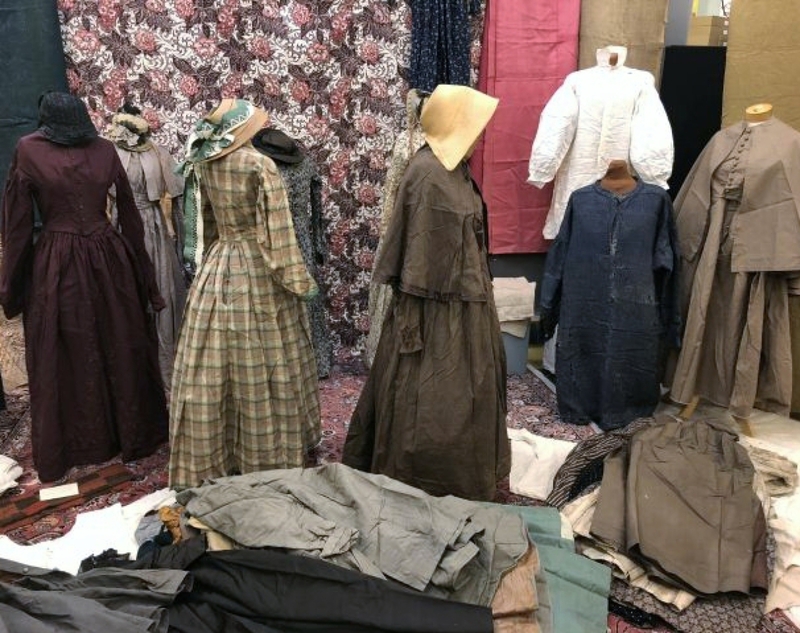 Generations of clothing and textiles had been preserved. 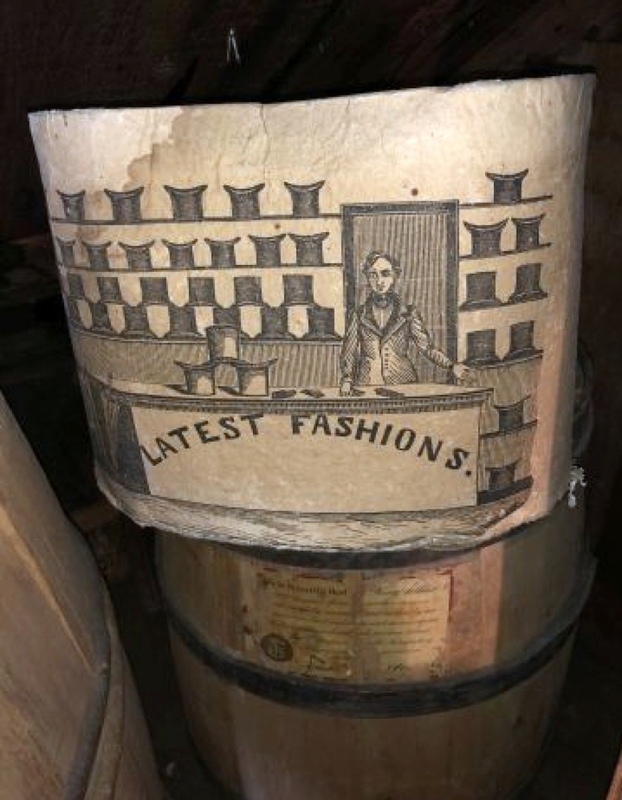 Meader said, “I unpacked more than 30 six-board chests, many of which were full of homespun textiles, and many had been made on the loom that was still in the attic. I don’t think I’ve ever dealt with a better group of textiles. Many of the dresses had initials on them and they were packed in layers, separated by newspapers of the day, so you could really see the progression. 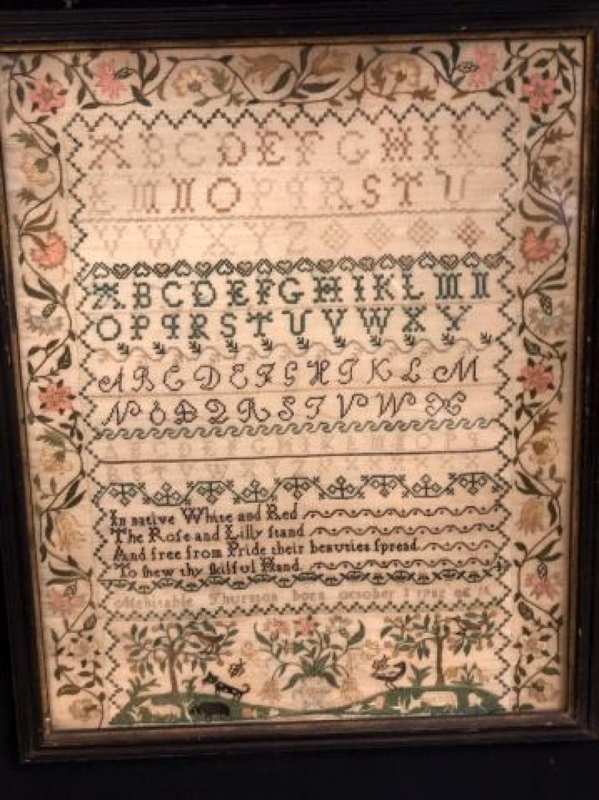 Very few had any mouse or insect damage, which was a real surprise.” A lovely copperplate whole-cloth quilt, fitted for a poster bed, went for $1,323. Another colorful copperplate whole-cloth quilt earned $1,150. 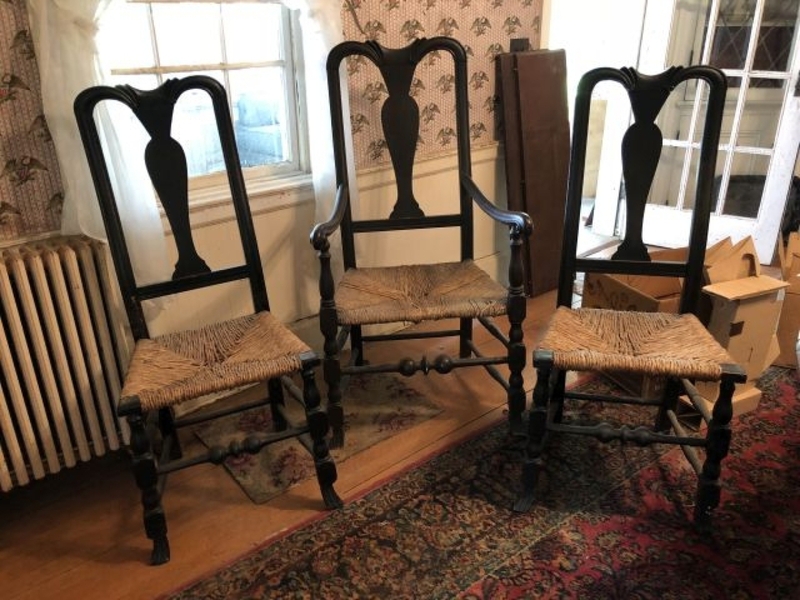 The large Eighteenth Century loom that was found in the attic sold for $805, the same price received for mid-Nineteenth Century matching dresses for a mother and child. Many were surprised when a man’s white homespun shirt realized $748. Generations of clothing had been carefully packed away for years. These dresses sold individually, most in the $300 to $500 price range. There were four flintlock muskets and a flintlock pistol sold that are worth additional research. Family tradition said that the muskets had been picked up at the site of the Battle of Bunker Hill, a few days after that battle, by a family member who was part of a group sent to the site to count the dead. 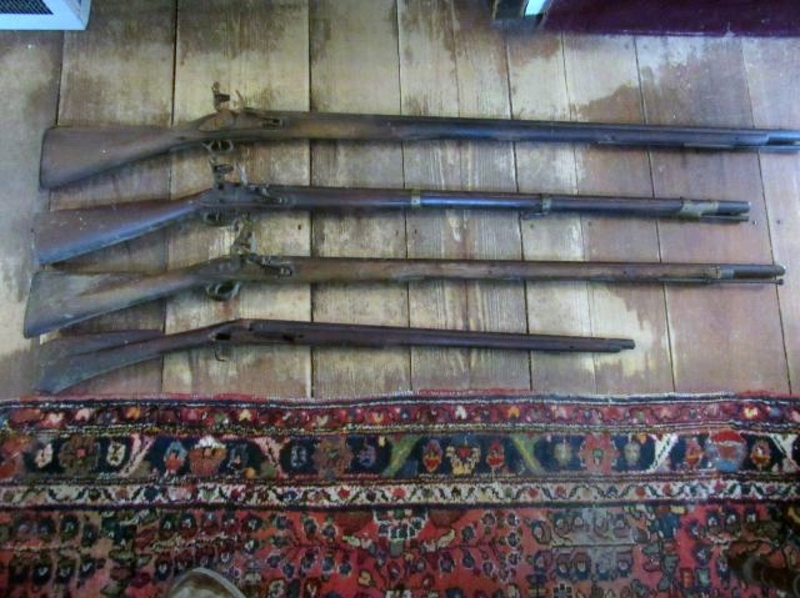 The muskets were not in great condition and sold for $1,380 to $2,185. 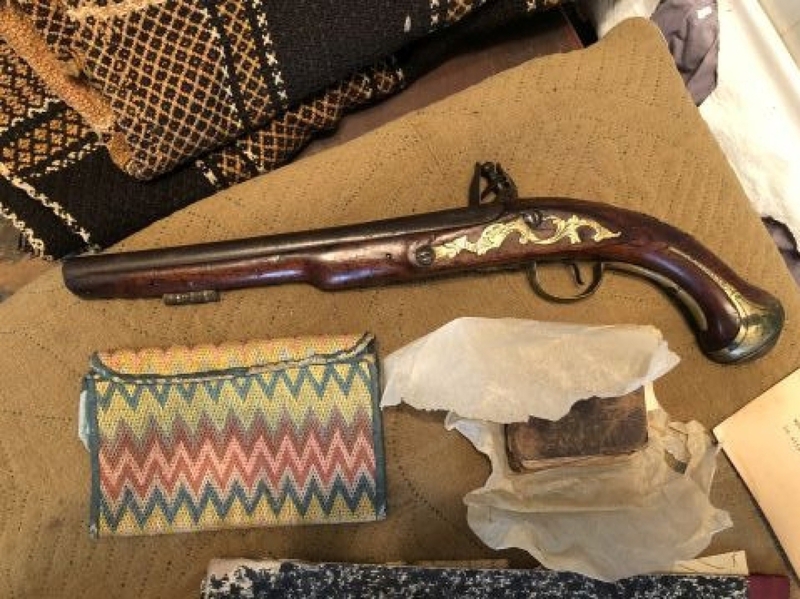 A flintlock pistol, that may also have come from the battle site, had been well taken care of and sold for $8,050. If it can be established that they came from the site of the battle, their value might be significantly higher. 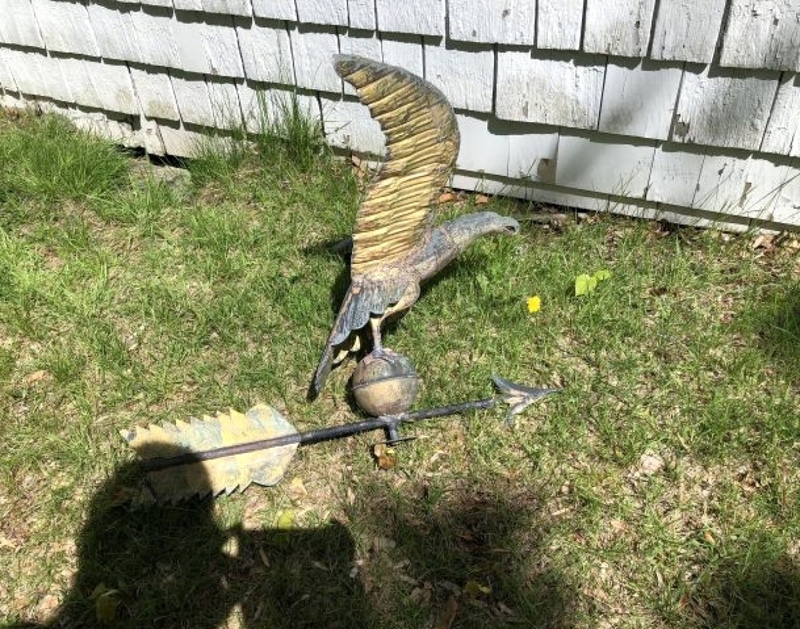 Other interesting lots included a nice prisoner-of-war carved bone pincushion, carved with an American eagle and dated 1881, that brought $863. Dr D.T. 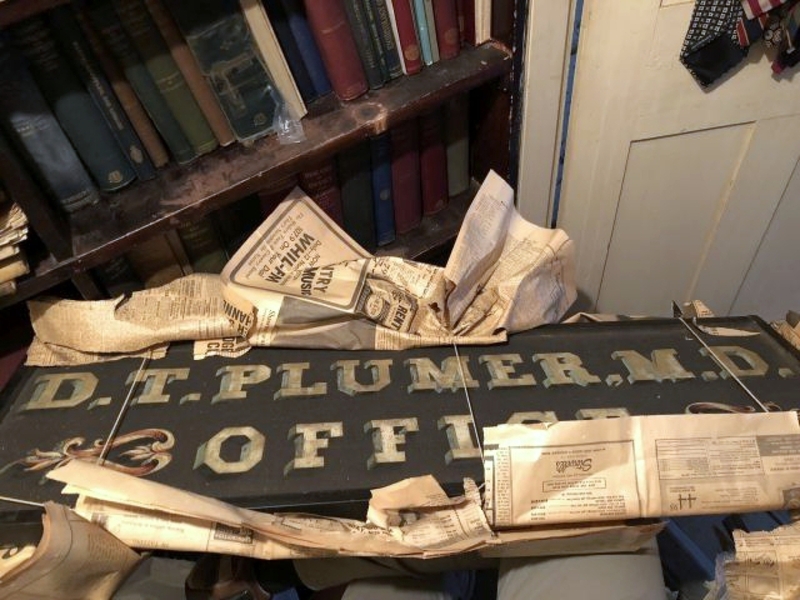 Plumer’s 1843 decorated trade sign sold for $3,565. 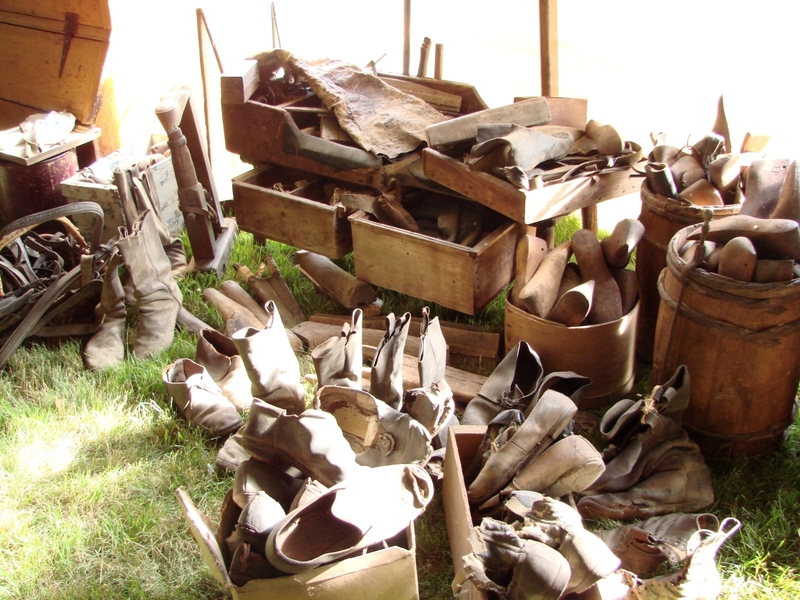 A virtually complete cobbler’s shop, which sold in one lot and included the cobbler’s bench and tools, several lasts, several early pairs of leather shoes and boots, and the cobbler’s well-worn, full length leather apron, achieved $1,610. A barrel of large pieces of old leather sold separately for $748. 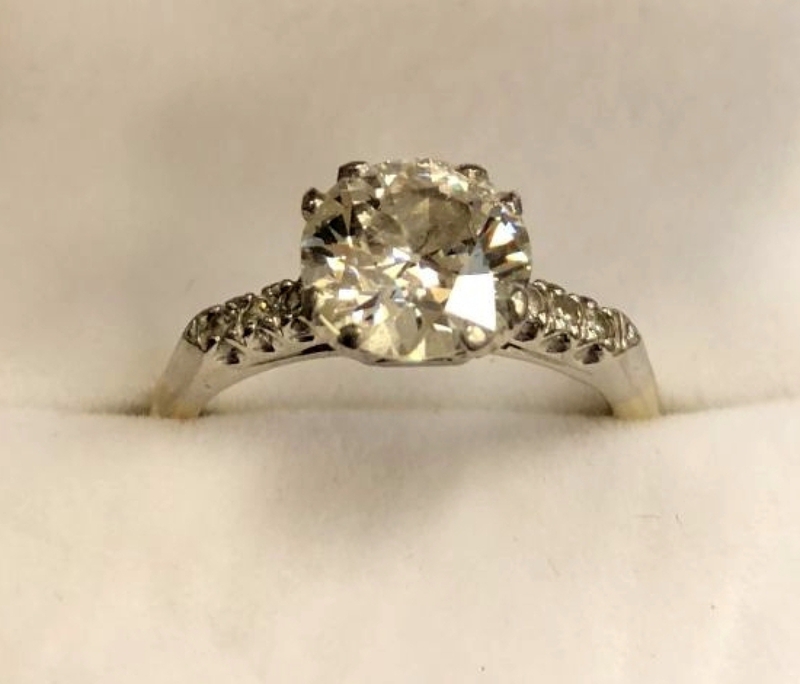 A platinum and gold ring with a 2-carat old European cut diamond led the 90 lots of jewelry and silver, finishing at $9,775. McInnis was pleased with the results. “I don’t think I’ve had such an enthusiastic crowd. They were real ‘antiquers,’ who appreciated even the smallest early objects. Even things like ox-yokes went to happy buyers. I think folks realized that the sale represented the end of an era, certainly the end of the family whose things we were selling. It looked like there were more than 400 people there on Saturday and many were back for Sunday. We didn’t do anything different in the way of promotion that we don’t always do. When the stuff is great, the buyers will be there.” That sounds like an accurate assessment of the sale. Prices include the buyer’s premium as quoted by the auction house. For information, www.mcinnisauctions.com or 800-822-1417. The Revolutionary War-era flintlock pistol may have been picked up at the site of the Battle of Bunker Hill. It had been well taken care of, and two bidders battled until it reached $8,050. The flame-stitched purse sold for $805.